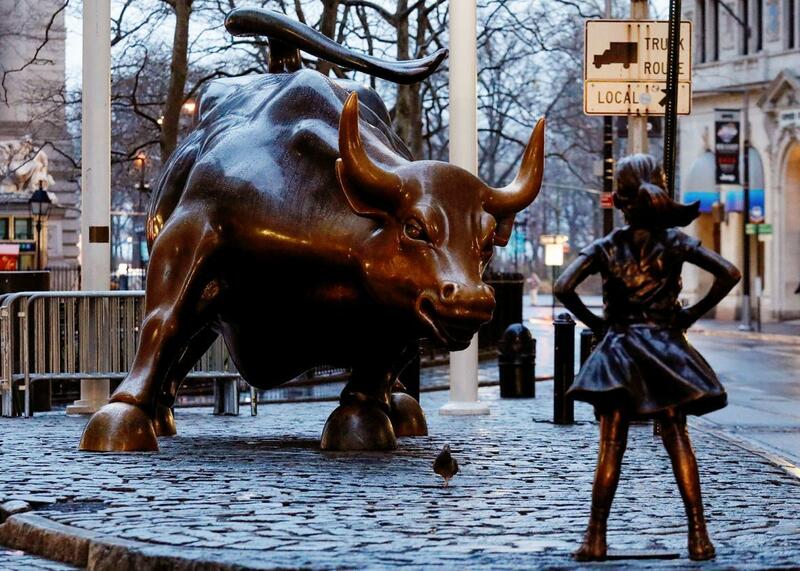 A bronze little girl sculpture joins the Charging Bull on Wall Street to promote gender equity. A Bronze Little Girl Has Arrived to Face Down the Wall Street Bull. This Should Go Well. Welcome to New York, hun. The statue of a girl facing the Wall St. Bull in New York on Tuesday. The statue of a bronze bull near Wall Street symbolizes American big business’s legendary take-no-prisoners attitude, but until this week, it never had a specific target to charge at. Now, a statue of a little girl has been plopped down directly in the bull’s path in downtown New York City’s Bowling Green Park. A helpless child about to be attacked by an angry wild animal: What a perfect metaphor for American society at this moment. The sculpture, by artist Kristen Visbal, joins the bull just in time for International Women’s Day on Wednesday and is actually (groan) part of an ad campaign from investment management company State Street Global Investors and the advertising firm McCann. SSGA wants to use the new public art to call attention to gender diversity and is advocating for the companies it works with—there are some 3,500—to increase the number of women on their corporate boards. “Know the power of women in leadership,” says a plaque at the foot of the girl, according to the New York Daily News. “SHE makes a difference.” As Reuters reported, the team behind the new sculpture hopes it will stay in place for at least a month, and maybe longer. More women on corporate boards is a worthy goal, but does a bronze little girl sculpture need to be harm’s way to achieve it? The girl is supposed to be defiantly starring the bull down, but one doesn’t have to be a professional matador to see that in a contest between a giant bull and a tiny human, the bull is one to bet on. (And why is she against the bull anyway, if the bull represents capitalism and success?) “Let’s just send this girl out to fight a bull and see what happens” is what Wall Street types might call a risky investment. Facing down a bull when you are a 75-pound elementary schooler is not fearless; it represents a systemic societal failure. Give this girl resources to fight the bull rather than just sending her out there on her own: a red cape, a team of bullfighting assistants, bodily autonomy and a shot at equal pay. Otherwise, that bull is going to trample her every time.